SAN FRANCISCO -- Mayor Ed Lee, who oversaw a technology-driven economic boom in the city that brought with it sky-high housing prices, died suddenly early Tuesday at age 65. A statement from the Lee's office said the city's first Asian-American mayor died at 1:11 a.m. at Zuckerberg San Francisco General Hospital. "It is with profound sadness and terrible grief that we confirm that Mayor Edwin M. Lee passed away," the statement said. Lee was surrounded by family, friends and colleagues. No cause of death of reported. Lee was appointed mayor by the Board of Supervisors in 2011, replacing Gavin Newsom, who was elected the state's lieutenant governor. Lee went on to win a four-year term in 2011 and was re-elected in 2015. Lee, who was married and had two daughters, was a civil rights lawyer who became the San Francisco city administrator before taking over as mayor. 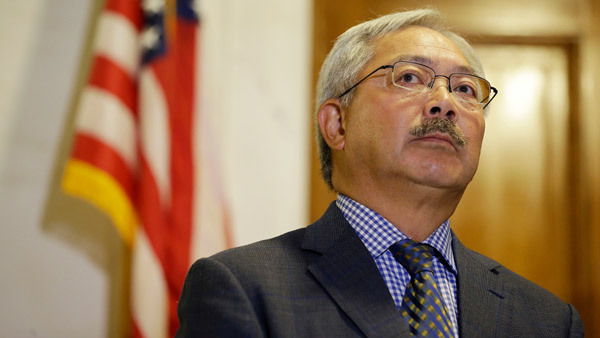 He was a staunch supporter of San Francisco's sanctuary city policy toward immigrants, a stance he reiterated last month when a Mexican man who had been repeatedly deported was acquitted of murder in the 2015 killing of Kate Steinle. The case became a flashpoint in the nation's immigration debate, with then-candidate Donald Trump repeatedly referencing it as an example of the need for stricter immigration policies and a wall along the Mexican border. Lee was an advocate for the poor but detractors claimed he catered too much to Silicon Valley, citing his brokering of a tax break in 2011 to benefit Twitter as part of a remake of the city's downtown. Housing prices have surged in San Francisco with modest homes now topping $1.5 million, and Lee faced criticism for not doing more to provide affordable housing for the working class.